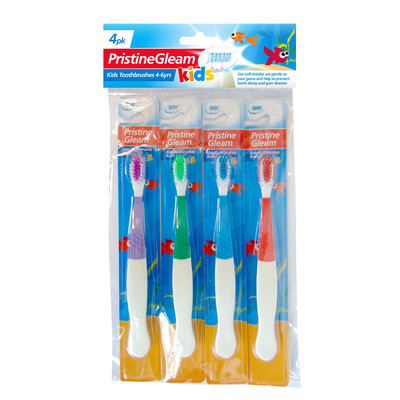 Suitable for use by children, our Kids Toothbrushes 4pk are a hand addition to any youth residential environments or primary schools. Provided in a handy pack of 4, each brush boasts a curved handle for firm gripping with soft nylon bristles that work to remove plaque and food residue. Designed for repeated and regular use, each pack comes with a range of colours for visual identification and are compatible with all brands of toothpaste. Use these tools to help educate your pupils on the importance of dental hygiene while supporting their growth into thriving young adults with this pack of durable toothbrushes. Here at Gompels, we have a wide range of Teeth Cleaning and Dental Supplies to ensure every mouth sparkles.